I ran late when driving to the theatre because first I couldn't find a taxi (and that in NYC!) and then there was heavy traffic, but I managed to get to the theater on time. (Latecomers would not be seated.) The tickets a friend of mine had won on Twitter were ready for me at the box office. I was in the fifth row, center, with a very good view. As Kate emerged in her black, short dress and walked across the stage to her chair I immediately thought: 'Wow, she looks just as great as in her pictures!' But when she moved during the play, changing her expressions and engaging with all her heart she was even more beautiful then I had imagined. When she read/played her parts she always put on a pair of thick rimmed, brown plastic reading glasses, but always looked over the top of them so you could see her eyes. I was barely watching the other actresses when they were talking (except Kristine Nielsen, she was just too hilarious) but instead focused Kate's changing reactions to the stories the others told. I saw the many characters she played on her face during the play - so many emotions. And every time she smiled and tilted her head ever so slightly it was like the sun had emerged for me in the dark theatre. I know many people adore her smile, but seeing it live was even better than on film. Kate had many, really funny parts. She does have a thing for comedy and a really good sense of timing. She also had many parts about breasts and wasn't afraid to demonstrate what she was talking about! It was so funny! A phone went off during one of the monologues but she kept on speaking as though nothing happened. I think there were some fellow Kate fans in the audience. On the right side of the theater there were some women who often laughed loudly when she spoke, and so did one guy in the back. She got many laughs the whole time! The play was so much fun that time flew by and it was over too soon. The actresses got standing ovations in the end. Then I walked out to wait for Kate at the stage door. She came out second, after Kristine Nielson. She wore a white blouse and black cloth trousers. I was a little disappointed to see her hair pulled back into a ponytail after she looked so radiant with long, flowing hair on the stage. She looked around and pointed at a man standing near a car and said: 'Ah, there he is.' Then she went down the few stairs to greet her waiting fans. There were about 10 people who got her autograph and photo in the end. 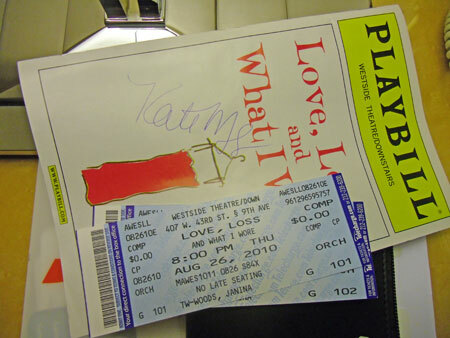 First she signed the Playbill of the two women who stood to my right, and then it was my turn. I had so much to say, but then she looked at me, smiled and said: 'Hey, how are you tonight?' I only managed to say: 'Great! Would you sign this for me?' and handed her the Playbill and a pen. As she gave them back I told her: 'Actually I have something for you.' 'You do?' she asked in her deep and beautiful voice. I searched my bag and handed her an envelope. 'I was told to give this to you by a friend of mine from Italy.' Kate took the envelope and looked at the words written on it. It just said: To Kate. 'She met you at a convention in Italy earlier this year.' Kate looked up and smiled at me: 'Really? So sweet.' That was the point where I was melting looking at her. I barely managed to say: 'Yeah, I believe you ate at the same table one night.' 'What's her name?' - 'Agata.' Kate seemed to think back for a little while, but then smiled at me again. 'And this is from me.' I said and handed her a little box. 'Oh, thank you, thank you darling.' she replied and put the envelope and box in her handbag. 'Could I have a photo?' I asked... rather shyly. 'Oh, sure,' Kate replied. I turned towards my boyfriend who had the camera waiting and she put her arm around me for the photo. I think you can see all my emotions in that moment in the picture. I was extremely happy. I thanked Kate and she went on to the next waiting women. She went rather quickly through all of them and then sat in the waiting car, talking to the guy she had earlier pointed at. She sat there for a while, probably waiting for Allison Mack, who was still signing autographs. I heard her saying that it was her (Allison’s) last performance and maybe she and Kate went out to celebrate. I will never know. :) But I got Allison's autograph too - her performance was great and she seemed like a really nice person, taking her time for all the fans. After a few more minutes of looking at Kate sitting in the car I went off and got a taxi back to the hotel, looking forward to Saturday. The play on Saturday was even better than on Thursday. The contents were the same, but the whole feeling inside the theatre was absolutely fantastic. You could really see how important a good audience is for such an intimate setting like in the Westside Theatre Downstairs which only seats about hundred people. The purse scene done by Kristine Nielsen was especially awesome. The audience went wild with laughter. I was seeing it for the second time, but I laughed so hard I had tears in my eyes. Kate had to hold on to her chair because she too was laughing so much and with all her heart, as were all the other cast members. You could really see she was enjoying being on stage. I held eye contact with her for a few seconds several times during the play (my seat was on the left, much closer to the stage this time) and I was literally melting in my seat. Perhaps she wondered why I kept staring only at her the whole time... ;) The actresses earned standing ovations and then it was time to wait in front of the theatre again. This time Kate emerged last from the stage door, carrying some flowers. She started talking with a group of women. 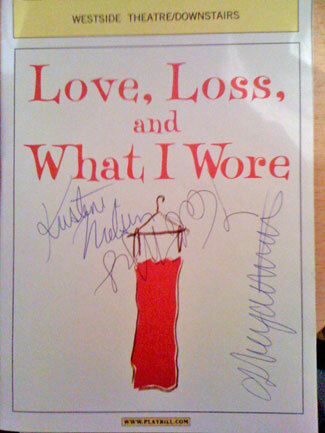 I got Kristine's autograph; I also got Ashley Austin Morris' autograph – she had replaced Allison Mack in the cast. She had the same script but gave a really different performance and I thought she was very good. Then I wanted to get Kate's autograph again because she was walking into my direction. She grabbed the Playbill as she walked by and signed it without exchanging a word with me and went on. I was a little sad about that, seeing her walk off like that. I had many things to say... how much I adore her, that she's my idol... that I had come from Switzerland to NYC just to see her... and so much more... all the fangirlish stuff I had in my mind. In the end, all I can say about Love, Loss and What I Wore is that every woman on the planet should go and see that play! Even without Kate it's still more than worth the journey to NYC to see it!